The Breakout Beast EA has been completely reworked and updated to version 2.0. After many months of research, development and testing to improve on the breakout strategy, we have made some major updates to the EA. 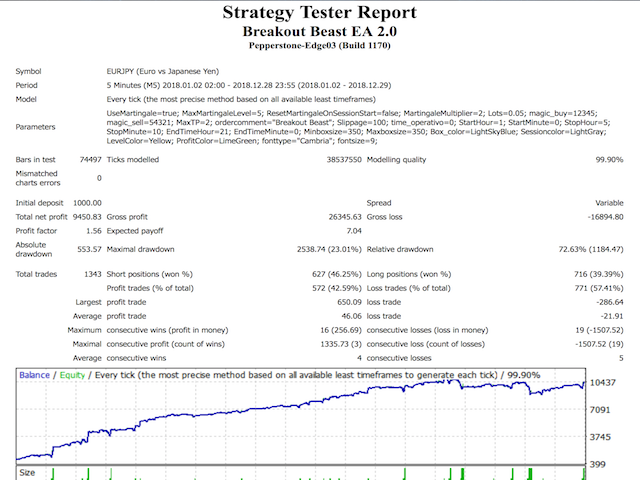 Instead of trading the volatile and risky London session we have instead changed to trading the daily breakout of the Asian session, and by doing this we have reduced overall risk and improved the performance and profitability of the EA. 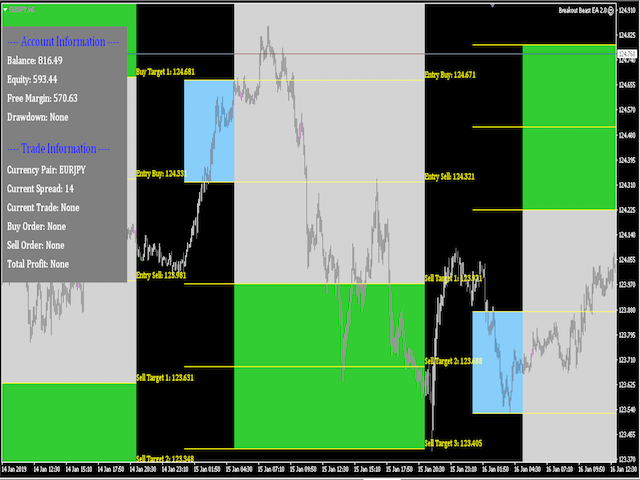 Recommended trading pair is EURJPY on M5 time frame. This EA needs little to no intervention or monitoring, simply load the EA on the chart, set your lot size based on your personal risk management, and that's it, let it do its thing. 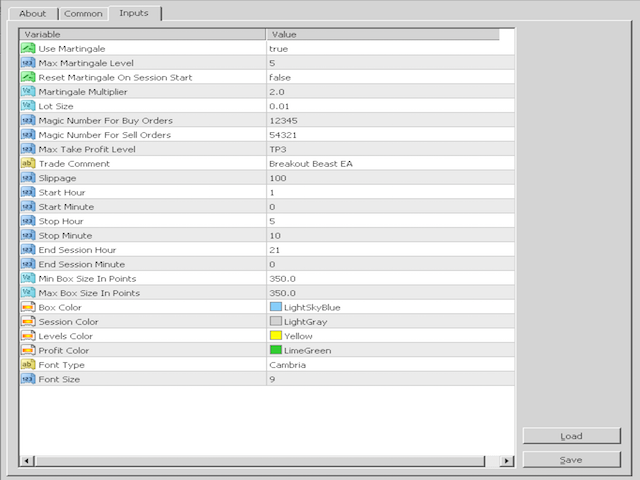 The input parameters can be edited, but the default settings have been optimized for best performance. This EA does utilize Martingale to recoup losses if there is a false breakout. The default Martingale level is 5, and there is the option to reset the sequence on each new session start. You can also edit the Martingale multiplier. The Martingale settings can be fully edited and deactivated if you don't want to use it. Use Martingale - Select to use Martingale function or not. Max Martingale Level - Level of Martingale. Reset Martingale On Session Start - Select to reset the Martingale level sequence. Martingale Multiplier - Select the multiplier value. Lot Size - Select fixed lot size. Magic Number For Buy Orders - Select the magic number for buy orders. Magic Number For Sell Orders - Select the magic number for sell orders. 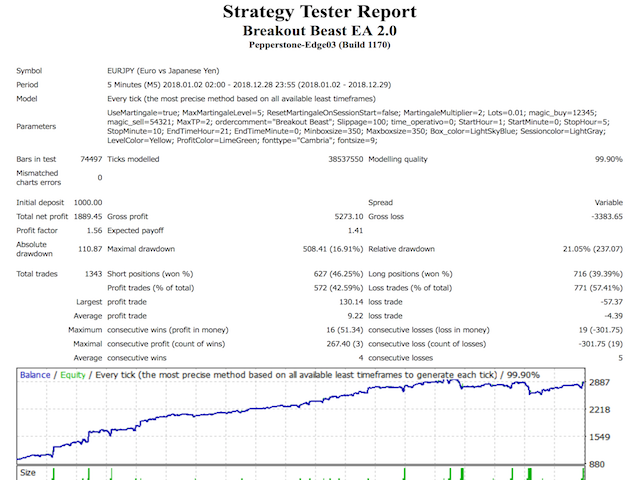 Max Take Profit Level - Select the take profit target level. Trade Comment - Enter trade comment here. Slippage - Select the max slippage. Start Hour - Select box start hour. Start Minute - Select box start minute. Stop Hour - Select box stop hour. Stop Minute - Select box stop minute. End Session Hour - Select session end hour. End Session Minute - Select the session end minute. Min Box Size In Points - Select the minimum box size in points. Max Box Size In Points - Select the maximum box size in points. Box Color - Select the color of the breakout box. Session Color - Select the session color. Level Color - Select the color to display the levels. Profit Color - Select the color to show the profit. Font Type - Select the font type you want to use. Font Size - Select what size font size you want to use. If you have any further questions please feel free to ask, and I'll be happy to assist you. I wish you best of success with the new Breakout Beast EA! A minor update was made to the Start & Stop time sessions. Major updates have been made to this latest version. Please read the description for full details. Updates were made to the martingale logic, and slippage was added as an input.